Some time ago an Ohio man discovered how hard it was to come back from the dead. 25 years before his return home, he had been reported missing. At that time he was unemployed, addicted, and hopelessly delinquent in child support payments. So he went into hiding. But suddenly he decided to come back. When he went to court to reverse the declaration that he was “legally dead”, the judge turned down the request, citing a three-year time limit for changing a death ruling. There have been at least ten hockey personalities who have experienced the same situation. This past November one of the most popular inductees into the Hockey Hall of Fame was Pat Burns, whose coaching career with Montreal, Toronto, Boston, and New Jersey spanned 14 years. Sadly, this honour was granted posthumously, since he lost the battle with cancer four years previously. His passing took place on November 19, 2010. But, as he said in disgust in September of that year: “They’ve had me dead since June”. This rather general accusation was prompted by a report from the Maple Leafs’ Cliff Fletcher on September 17. The former policeman had just arrived home from the hospital to find that he was listed as dead by the Toronto Star. Burn’s friend, Kevin Dixon, quickly got to Fletcher in order to squelch the rumour. Thus forced the Queen City executive, who had been badly misinformed, to make a public announcement to the contrary. But this was not the first instance of such panic button propaganda. Back in 1918 the fortunes of Lester and Frank Patrick’s Pacific Coast Hockey League were beginning to look more promising, because the conclusion of World War I meant skaters were returning from the Armed Forces, and there were glimmers of hope for the three-team loop to survive. But on July 6, the famous entrepreneurs picked up their morning paper to see a bold headline mourning the death of Art Ross. The Patricks had grown up in Montreal’s Westmount district with Ross, who was one of the greatest players of his time, and, like them, his friends, Ross was a legendary innovator. It was reported that he had been killed in a road accident near Boston. Deeply shocked over the loss of their lifetime pal, they dispatched a telegram of condolence to his family. The next day, however, there was another headline: “Art Ross Arrives in Montreal. He Is Alive And Well”. The accompanying explanation read as follows: “Mr. Ross, who had been presumed dead, arrived home with the remains of his nephew, Hugh Ross, for burial on Monday. Hugh Ross died of a motorcycle accident. Each had been riding his own bike, and Hugh swerved to avoid a lumber rig, crashing to into an embankment. Art also tumbled, but suffered only slight injuries.” He said the greatest shock was his receipt of the Patrick’s wire lamenting his death! Tony Savage’s professional career spanned 10 seasons, but he managed only 49 games in the NHL. It was in 1934 while he was skating for the Syracuse Stars of the IHL that his wife received a letter from former teammate, Al Murray, who was then with the New York Americans. He expressed his deepest sorrow and condolences because of Tony’s passing. Since her better half was at home at the time it cushioned the shock. It turned out that a man of exactly the same name had died, and the local press assumed it was he. In fact they included several complimentary remarks about his on-ice skills. In December of 1939, the dashing Reginald “Hooley” Smith (nicknamed after the comic strip character, Happy Hooligan), famed member of the Montreal Maroons’ “S” line along with “Babe” Siebert and Nels Stewart, was playing out his string with the old New York Americans. On a road trip, which took them to Montreal, he came down with the flu and was left there to recuperate. A quarter of a century would pass before this kind of a mistake would be made again; this time it affected 15,000 people. Irwin “Ace” Bailey, whose career was cut short by Eddie Shore’s infamous crosscheck in 1933, had been the Penalty Time-Keeper for many years at Maple Leaf Gardens. On Dec 4, when he casually walked in to the big rink to take his usual position in the sin bin, hockey officials and fans alike could hardly believe their eyes. He had been reported dead, and this prompted a lot of people to blink and shake their heads when he walked in very much alive. It was actually Harold Baillie, a Toronto Parks employee, who had suffered a heart attack as he inspected the damage to his car after a minor traffic mishap. He was known to his fellow workers as “Ace”, and this led to the confusion and the erroneous report. There was even talk of observing a period of silence in his honour previous to the Leafs-Canadiens match. Mention the name of Bobby Baun to any hockey fan and automatically they will recall his courageous determination in the 1964 playoffs. Pitted against the Red Wings, Leafs were fighting to match their 1940’s record of three Stanley Cups in a row. With 10 min left in the final frame of game six the “Boomer” slid in front of a Gordie Howe blast, which resulted in a broken bone in his ankle. Carried off on a stretcher, he was deemed to be through for the season. But, with his limb frozen and taped he came back several minutes later to score the goal with forced a seventh and deciding match in the series. He also skated in THAT contest, joining his mates in the victorious triumph. But Baun was another who joined the list of NHL’ers who can boast premature obituaries. In 1972, his buddy, Don Giffin, went hunting with his trusty dog—who was named “Boomer” after the Leaf rearguard. Tragically he accidently shot his pooch. The grapevine picked up the news, and in no time at all, “Boomer” morphed into “Boomer” Baun, making the faux pas many more times serious. And, as “Ace” Bailey, Bobby wandered into the Gardens, where the report had multiplied like rabbits, a dead man come to life! Ken “Tubby” McAuley played goal for the New York Rangers during those bleak years of World War II. He has the dubious distinction of holding two NHL records. On Feb.19, 1944, he handled the most shots ever during a league game. He stopped 86 of the 91 fired at him by the opposition Boston Bruins. Just a month earlier he was on the wrong end of the most lop-sided game in the circuit’s history. The Detroit Red Wings pumped 15 pucks by him, while the hapless Blueshirts were shutout by Connie Dion. McAuley recalled in a 1984 interview that their already depleted roster was riddled with injuries, and eight players from the minor-league Rovers were filling in. The plump backstop, born in Edmonton, returned to his hometown following his stint on Broadway, first to play with the Senior “A” Flyers, then to coach the Junior Oilers. In 1976 while attending a WHA game, he noticed in the Oilers’ programme that he was referred to as the “LATE” Ken “Tubby” McAuley. He was 65 at the time, and still active as a car salesman for a local dealership. “Very much alive and well”, he commented. The 1992 NHL Official Guide and Record Book placed an asterisk beside the name of former Maple Leaf left winger, and Hall Of Fame member, Harry Watson. This, according to normal practice, indicates that he was deceased. “I guess I haven’t been reading the obituaries closely enough”, he joked when he was contacted about the error. 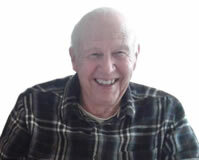 At the time, although he was 74, he daily went to work at Pioneer Label Co. in Markham, Ont. The Sept. 10, 1993 issue of the HOCKEY NEWS included the headline: “McNab still alive, living life to the Max”. It was a retraction of a report out of Toronto that Max McNab, former NHL player, and then Manager of the New Jersey Devils had passed away. He was 69 years old at the time, and insisted the next day that was indeed alive, and “never felt better!” While he had earlier in the summer been hospitalized for angioplasty procedures, he was fully recovered. “I’ve just lost 10 pounds. I’ve got a new diet. Everything I enjoy eating they’ve taken away from me!’ The confusion arose as a result of the then-recent death of his son Peter’s father-in-LAW, Goodwin Gibson in Toronto. Doubtless the most bizarre prevarication of all involves none other than “Red” Storey, the happy-go-lucky, and perhaps most celebrated whistle-tooter in NHL history. 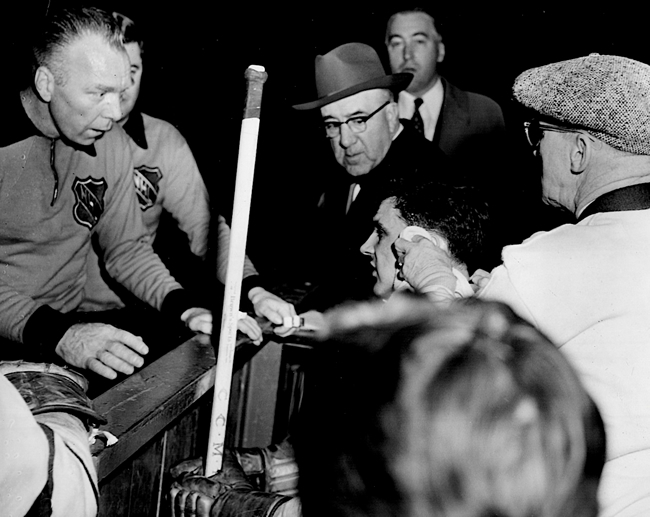 He is remembered, long after he hung up his skates, just as much for his story telling as for his officiating. But one of his lesser known experiences deserves its place in the “believe it or not” hall of fame. Another employee overheard and thought he heard, “Red Storey is dead!” The pin-striper’s wife was informed, as was a radio station. Needless to say there were endless calls to the Storey home—met with the same explanation as was given by Mr. Twain. The Comic strip character, Pogo, used to say, “I hate death; in fact, I could live forever without it!” These ten, at least, extended their good fortune in doing that very thing for a little longer!